If you've ever asked yourself what to wear, more often times than not, you've stumbled into your wardrobe, going through just as much clutter as well as necessity to just to find out what it is you are going to wear. Fortunately with a little bit of organization, and some daily maintenance, finding the perfect outfit can be less stressful. Keeping the clothes in your closet organized doesn't have to be a daunting task, let us take a look at what you can do to make your closet a little cleaner. First, you will need to tear down the mess that is in your closet. You can do this in a cleaner manner by following these steps. 1. Make sure you have time to organize your wardrobe or closet. You need to set aside some time free of any distractions. The task at hand is what is important here. 2. Take everything out of your closet. This could be a bit messy, but try to pile up the mess so that it isn't scattered all over the floor. If it isn't a permanent fixture, you need to take it out. 3. You will require a bit of organization and fair judgment here, so keep this in mind when sorting. You will need to start organizing your clothes into the following piles. Your perfect fits pile, your not so perfect fits pile, and your donation pile. The donation pile and your not so perfect fits pile will need to be sorted into boxes. 4. For the box of clothes that don't quite fit perfectly, you will want to store it in a location that is accessible but out of the way. In about 6 months, go through the same pile and see if they still will end up fitting you or if you need to donate them as well. 5. Separate out the clothes and shoes you no longer wear or are no longer fashionable to you. These also need to be donated. 6. Donate all the clothes you are deciding not to keep. You can either donate them to a shelter, a church, or a store like goodwill or Salvation Army for a little bit of extra money. 7. Put everything else that isn't clothes, shoes, or accessories into another box. Closets at times can seem like good places to put all sorts of random items you collect over the years, but this also contributes to its disorganized state. You need to put those items in a separate box and find a new home for them. Now that we've taken all the unnecessary items out of your closet, it's time to put it back together. This part of the organization process is a little bit easier. Still, you will want to take the following steps in order to ensure a neat closet. 1. You now need to separate your clothes into the following 3 piles, work clothes, everyday clothes, and special occasions. 2. Once these 3 piles are separated, you will then want to separate the piles into smaller piles. For example, all your work skirts should be separated from the blouses, blazers, or other clothes. Do this for all 3 of these piles. 3. Start putting your clothes back in the closet by first hanging your special occasion items. Make sure all clasps, seams and zippers are not broken. Any clothes with broken clasps need to be set aside for fixing. 4. Hang the clothes on plastic or wooden hangers. Do not use metal hangers, as they can bend, making clothes fall or even snag certain materials. 5. Make sure your special occasion clothes are placed near a wall. The clothes you wear most often are the ones that need to be placed more toward the middle of your closet or wardrobe. 6. Repeat the previous 3 steps for clothes that are no longer in season and hang them near the opposite wall of the closet. Your work and everyday clothes should be in the middle for easy access to them. 7. Finally, use a shoe rack on the floor to organize all of your shoes. Make sure shoes that are worn less get placed in the back while the shoes you wear most often get placed in the front. Finding an outfit to wear doesn't have to be difficult. 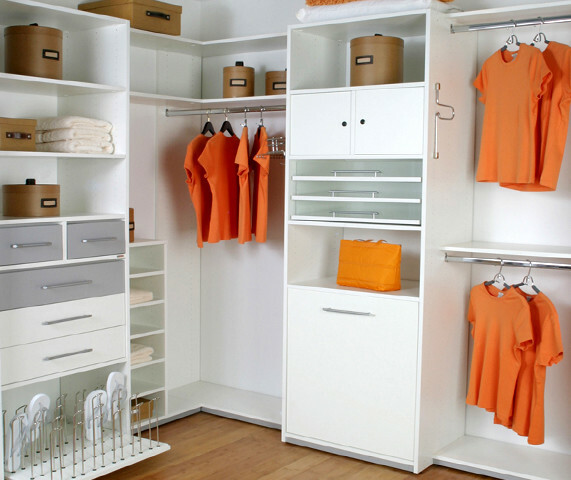 Simply keeping your closet organized can make the task a lot easier. Do the steps mentioned above and make sure the closet gets a little bit of maintenance, and you will find what you want to wear less of a stressful experience.